You can have an army of bite sized wonders perfect for an appetizer, party hors d’oeuvres or side dish for dinner ready in less than 25 minutes. These stuffed mushrooms are equally as delicious as the more time consuming recipes, but done in the time it takes to watch an episode of your favorite tv sitcom. The results are similar to a popular Italian restaurant, but a few healthy swaps slash the calories and fat. The sampler sized portion at the chain eatery has 280 calories and 19 grams of fat. This speedy version has just 50 calories and 2 grams of fat! 2. Remove stems from mushrooms and dice. 3. Toss mushroom stems and garlic in a hot pan along with a splash of olive oil for 3 minutes. 4. 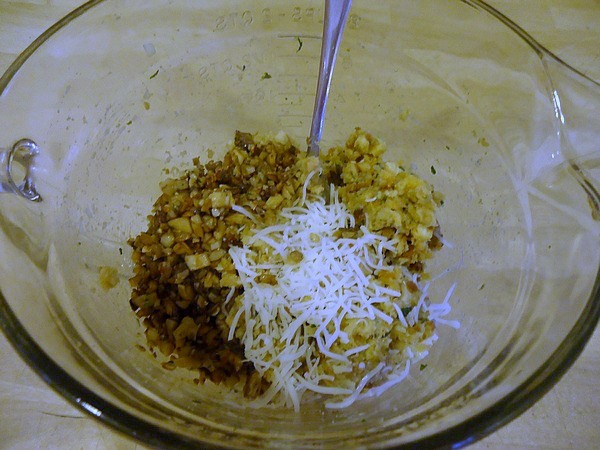 Mix hot water, butter, garlic, chopped stems, cheese and *clam juice with the stuffing in a mixing bowl. 5. Stuff mushrooms by spooning mixture into the open caps. 6. Lightly drizzle olive oil over the stuffed mushrooms and sprinkle a small handful of cheese on top. 7. Bake in an oven-safe pan or casserole dish for 18-20 minutes. Toss mushroom stems and garlic in a hot pan along with a splash of olive oil for 3 minutes. Mix hot water, butter, garlic, chopped stems, cheese and *clam juice with the stuffing in a mixing bowl. Stuff mushrooms by spooning mixture into the open caps. 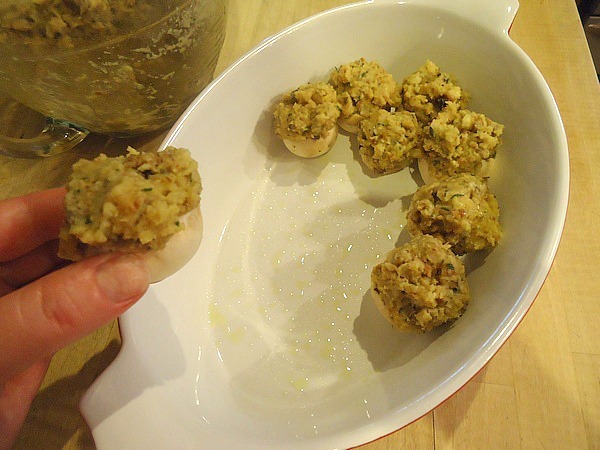 Lightly drizzle olive oil over the stuffed mushrooms and sprinkle a small handful of cheese on top. Bake in an oven-safe pan or casserole dish for 18-20 minutes. Stick a toothpick in each one or glide serenely around your party with a tray full of these delights and serve with cocktail napkin and a smile. You can also jazz up the stuffing by adding your touches like the addition of spinach, shredded crab or petite diced tomatoes. For someone that likes mushrooms these look great. Also look super easy to make.. wonder if I could trick my girls into stuffing them. Oh my how yummy i adore stuffed mushrooms must try this. This sounds lovely. Thank you for sharing. I’ve never been a big fan of mushrooms but I think I would eat them this way. This recipe looks really delicious. I love this idea!!! I pinned it and it will definitely be a new favorite in this house. Especially with big get togethers. I love stuffed mushrooms! I cant wait to try this one! 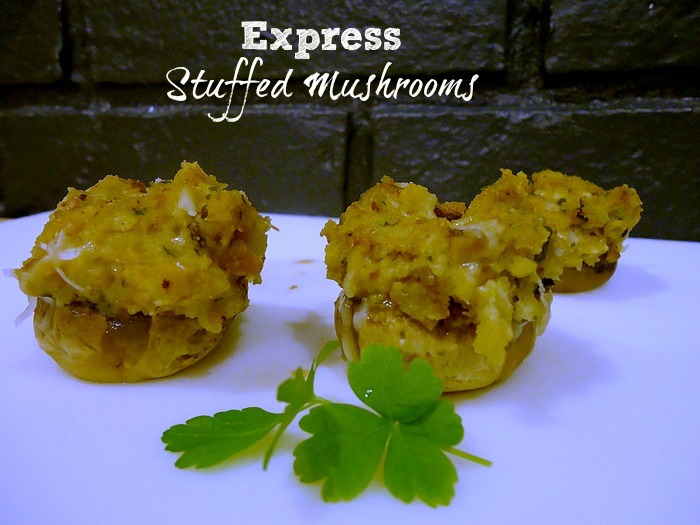 Okay, these look so easy, and my hubby LOVES stuffed mushrooms! I’m gonna try this on him, thank you! My husband and I both love stuffed mushrooms. I can not wait to try these out, we are having grilled chicken tonight and these would be perfect to go with it. This looks yummy and should have a nice texture too. Those look so tasty. I’ve always been wary to try stuffed mushrooms because they looked so complicated to make. I’ve never been a big fan of mushrooms but I might try this. I will eat them occasion and these look really tasty. Pinning this for future reference! We just discovered our son likes mushrooms. I’ll have to try these for him! We always make stuffed mushrooms around the Holidays. Not sure why we wait until then. I will have to surprise my Hubs and try these. Yum … I love stuffed mushrooms!! My husband LOVEs mushrooms but I’m not into them. This recipe might convince me otherwise! Mushroom lovers rejoice! You shared something new and easy. In heaven! I am not a huge mushrooms fan, but this actually looks really good. My husband loves mushrooms and these look delicious! Definitely trying them! I love stuffed mushrooms, but they can take forever to make. Totally trying your recipe out! I love stuffed mushrooms, the fact that they are fast is even better!!!! I can’t wait to try. I would for sure add the clam juice. Yummy. Thanks. I really love stuffed mushrooms. I usually make a spinach dip one, but I am definitely going to have to give this a try! They sound good. The little dab of cheese at the end is the perfect touch! I so love me some mushrooms. I haven’t had any in awhile so this looks like an excellent recipe to use. I do wish I could try these myself but I’m allergic to mushrooms. My dad would totally love this though! My husband would love these! He loves mushrooms- not my thing but its his! I love stuffed mushrooms though I have never tried making them before. Yours look really good. Ooooo this looks so yummy !! !